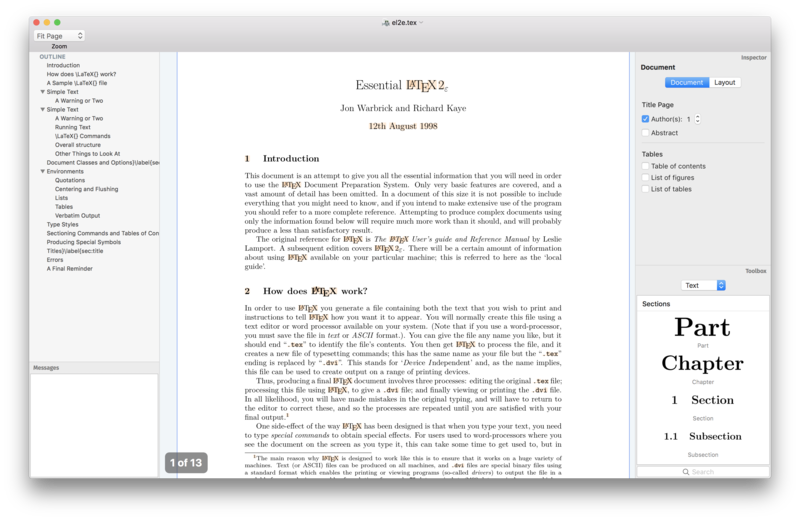 Compositor is a WYSIWYG LaTeX for Mac — a Mac app that brings WYSIWYG features to the LaTeX document preparation system widely used in academia for scientific and technical publications. Based on LaTeX, a document preparation system written by Leslie Lamport in the 1980s as a collection of macros for the TeX typesetting program developed by Stanford Professor Donald Knuth in the late 1970s, Compositor builds on a well-established platform of the highest quality typesetting that handles anything from letters to full-size books. Although LaTeX has seen widespread adoption over the last three decades, the way it works has changed little. Because of the limitations of late 1970s computer systems, the underlying TeX typesetting system was designed for batch processing, with limited interactivity via a command-line interface. It has therefore been stuck in an antiquated edit-compile-review workflow, in which a document has to be fully processed (“compiled”) by the system before the user can review the effects of changes. That results in a delay between typing the material in, and seeing the typeset result. A second improvement over traditional LaTeX use is Compositor’s unified WYSIWYG interface. In standard LaTeX workflows, the user edits the source code of a LaTeX document using a text editor, compiles it, and reviews the result in a separate PDF viewer application. With Compositor, editing and viewing are fully integrated – the user types directly into the viewer. Coupled with its real-time typesetting, Compositor delivers the same convenience and productivity of any modern word processor. If that sounds a bit abstract, here’s a YouTube video that shows the app in action. Despite these improvements, Compositor still works with regular plain text .tex files. There is no proprietary document format involved, so users can switch between different tools and workflows at any time. With Compositor, I also wanted to lower the entry barrier to getting up and running with LaTeX in the first place – a step that’s more complicated than it should be. The app is a small (~30MB) download and installs like any modern Mac app by simply dragging it to the Applications folder. That’s all there is to it – you’re all set for working with LaTeX documents! Compositor builds on the TeX Live LaTeX distribution and comes with a small subset of this distribution built right in. If a document uses extension packages not bundled with the app, they are automatically downloaded from CTAN and installed on demand. Please note that Compositor is a modern, sandboxed Mac app that doesn’t access any files outside its own sandbox (except for the files you tell it to open). I would like to point out that version 1.0 is in many respects a starting point, and will be undergoing further enhancement in the coming months. There is a blog post about current limitations which I have updated to reflect the state of development. Also, be sure to have a look at the public roadmap and issue tracker to see which bugfixes and improvements are already planned for upcoming releases. This build-up of features over the next few months is reflected in an early-adopter pricing strategy: all license purchases include lifetime updates, but the current entry price of $19 will rise to $29 midway through the year, and to $39 by end of the year. Because of the current limitations, please be sure to try out the app before you buy. A fully functional 60-day trial is available for download here. This should give you ample time to see if the product meets your requirements. Compositor has still way to go, but the technology is sound, and I’m looking forward to evolving it into the go-to solution for LaTeX on the Mac (there are currently no plans to support the Windows or Linux platforms). I’m an indie Mac & iOS developer from Austria. I’ve been using LaTeX in university, and I always loved it for the beautiful output it creates. With Compositor, I want to make this wonderful system more easily accessible and give it a productivity boost.